Layaway Started 26th May with Roy and the Rose Dress Shoes Added 15th June 2012. Layaway Finished 8th July & Shipped in two lots so everything was recieved by 16th August! Value for money is BRILLIANT with Dearmine! Their Dolls are so well made and very well priced for their high quality, especially their full-sets. I really can't complain as, as part of my order was during Dearmine's Summer Event, Wizard threw in a TON of absolutely amazing extras, including Extra Dear Lover Shoe parts, Dear Pet Wings, Extra hand parts, Wigs, Skyrider Air's limited outfit, Nekomata Roy's Fullset outfit (even though I'd ordered him without it), a Dear Lover dress, the Limited Jamhadar that was released with Shadow Skull...and several other extras! Even better. My absolute favourites are Helena, my Priscilla, and Hiroaki, my Roy. I am particularly impressed with how wonderfully Dear Lover girls pose despite having only single jointed legs and being such slender and delicately built girls! 1000%...Dearmine went well above and beyond my expectations! I already plan to when Dear Lover Dune is released in basic form, and I'll happily snap up a Nekomata Nabi whenever she's next released....plus in the future I'd like to talk to Wizard about requesting a blank head and parts for Priscilla or otherwise look at buying a second version of her blank as I have a very particular custom job I would love to have done on her. The items looked exactly like it, I was very impressed except they always from what I hear added sparkles to their face-ups which I loved very much as a bonus! * When did you order? June 15th 2013. He arrived on August 23rd 2013. * Was the quality appropriate for the price, in your opinion? Very much so, he's absolutely gorgeous and I feel like he's right on scale for other MSDs especially as a fullset. * Did the item look like the sales pictures? Yes, beyond his wig being slightly shorter than expect. Hardly a problem however. * Tell us some of the positives and negatives about this product (optional) The only real negative is that his hands have to come off to get the shirt on, and even that would be nitpicky to me! Everything is wonderfully made and he stands like a rock. He's got a nice feel to his resin, I like his weight and he's a wonderful white color! The face up is superb, just as expected from photos. Dearmine doesn't seem to hold back or mislead with photos (at least in this case). * Would you buy more from this company? 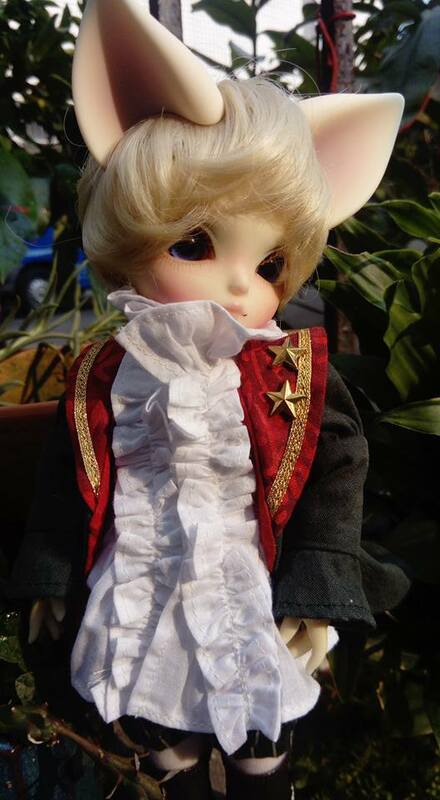 Absolutely~ He's already my second doll from Dearmine and I love two of their three lines in person. I would definitely expect to end up with several more of their dolls in time! * When did you order? 9th of January, 2014 and he shipped on the 29th. * Was the quality appropriate for the price, in your opinion? Oh, definitely! He is lovely from ear tip to the claws on his feet, his resin feels amazing, his clothes are really nicely made. * Tell us some of the positives and negatives about this product (optional) Their customer service is amazing, I had a problem where I couldn't sign in and they fixed it quickly. They shipped him really fast and he is absolutely perfect. My only negative would be that his head is a little floppy (easily fixed by sueding his neck hole) and that they don't send you emails when they ship. * Would you buy more from this company? I already have, and I definitely will again. 27th of January 2014. He arrived on 9th of March. Absolutely! His faceup is one of the most stunning ones I have ever seen. The clothes are made of very fine materials and are well made. The wig is super soft, fluffy and easy to style. Yes, though his faceup looks even better in real. I love him, so yes! Positive: His faceup is so sparkly! His eyes are beautiful. I was very happy to find out that he is a king at posing and very steady on his feet. His body is very light and nicely shaped. I'm especially fond of his hands and feet. Negative: His body has a lot of seam lines, but with the clothes on most of them are not noticeable. I have done a quick sanding, but I don't think it made much difference. Maybe I will do it more thoroughly later. He likes to bend his knees far too often, which is quite annoying. Otherwise he is very cooperative. His tail magnets could be better. To put his clothes on I have to remove his hands and feet. I sure won't change his clothes often. Even though the clothes are well made they missed sewing the lacing on his pants so they don't stand out. I'm going to try to fix it soon. Definitely. DearMine is a very nice company with wonderful customer service. * Was the quality appropriate for the price, in your opinion? Yes, definitely, face-up, dress, eyes, body everything is so well made, certainly worth the money! * Did the item look like the sales pictures? Very much so, she looks even better in real life because of the details. * Were you satisfied with the product? Yes, she is gorgeous! The Moonstone as with painted flowers and her pink (!) eyelashes are extremely pretty, she came with a black lamb wig that was easy to put on and stays in place XD. The clothes seem to be well made, lots of gorgeous lace with gold threads etc. Since she is my first BJD I can not compare her possibility to others, she seems very tightly strung, she can stand well on her own too. The magnetic ears stay in place ok, but the tail falls off easily when she wears the full set of clothes. Yes, I am already planning on buying a second doll from them, since doll and service are that amazing! 19th of July 2017. I order it by their Taiwan Dealer "DreamLand the O.D." with 4 Installments. And he arrive on 27th of Sep. Yes, the doll itself is very wonderful, and the eyes are exactly the same. The make-up, no only the face but the ears, are very delicate, but a little bit stronger than the picture. All clothes are good made. I am too satisfied to ask more. DP is a quite new line, and I cant find much information about the body data. It gains me some problem for looking clothes and shoes. But this is not really a positive. So far Benjamin can stand very stable. And he is very easy to be carried with. Yes. I am very interested in their Dear Beans line. I ordered on March 31rst. After crossing the ocean twice, the doll arrived on June 18th. Yes. It was a limited product, so the higher price was expected. The resin color was a bit lighter than I anticipated but it didn't bother me at all, I actually prefer it this way. Otherwise, it was pretty much exactly what I expected it to be. Positives: The doll is absolutely adorable. I love the color of the resin and its proportions! The head system is very unique and makes it look seamless. The magnets let me adjust the position of the ears and will make dressing the doll easier. Plus, it came in a very cute and well-made pouch, which will be extremely useful for me. Negatives: Not the best poser, but it was somewhat expected due to the proportions of the doll. A lot of magnets popped off right away when I tried opening the head and posing the ears, but it should be easy to fix. I also found putting the eyes in difficult, but that's probably because I'm not used to the doll's head system. Absolutely! Dearmine has great customer service and is easy to communicate with. The beans are also so cute, I just might buy a few more to create a small family (and have an excuse to actually buy dollhouse miniatures). Plus, since they are a Japanese company, their products (even limited ones) are somewhat easy to find on the Japanese second-hand market if you browse it regularly. I found a few limited ones for sale on Yahoo Japan Auctions while searching for more information about the dolls. The sales pics for Ares show more grayish eyes, and I got gold eyes, but still looks great! Otherwise yes they do. Positives: Very high quality and detailed clothing. Very sturdy too after me manhandling them to get the clothes on. The dolls themselves are well sculpted and expressive and are reasonably good posers. Ear magnets are pretty secure through the wigs but I wish I could say that for the tails. Negatives: Both dolls flop over like wet noodles if I happen to take them by the legs.Tails don't hold at all through clothing, thought it could just be the type of clothing they're wearing (Storm with a big floofy dress and Ares with thick leather pants.) There's a glaring seam line on Storm's left arm. Yes! I would like to own at least one Dear Bean in the future.